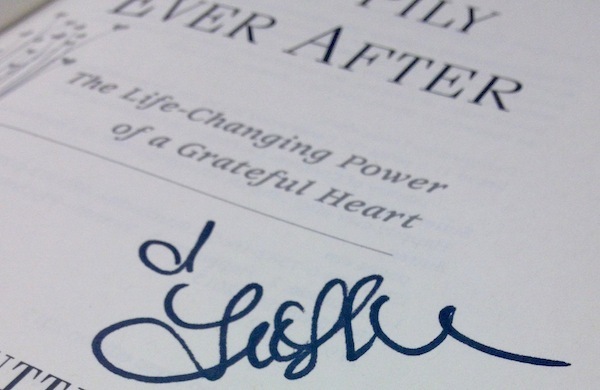 This Hardcover First Edition of Happily Ever After has been personally Autographed by Trista Sutter. Exclusively Made Available at PremiereCollectibles.com. Whether or not you remember Trista (Rehn) Sutter from her heartbreak on the first season of The Bachelor reality show or as the original Bachelorette, you’ve probably seen her on the cover of magazines like People and US Weekly or on shows like Ellen and Dancing with the Stars. She has rarely been out of the public eye since falling in love with Ryan Sutter on The Bachelorette more than ten years ago. This former pediatric physical therapist and Miami Heat dancer had her fairy tale fall into place with a whirlwind courtship and dream-come-true wedding to a poetry-writing firefighter (televised on ABC to more than 26 million viewers). The happy couple now has two adorable kids and a dog. Sutter is often asked her secret to being one of the rare reality-TV relationships to make it to the altar and beyond. Through personal stories, as well as anecdotes from friends, family, and experts, she shares the simple yet profound keys to finding everyday happiness and success: gratitude and grace. Trista Sutter was the runner-up of the very first season of The Bachelor, and became the first Bachelorette. Trista has been featured in numerous media outlets, including Parade and Good Housekeeping, EOnline.com, and Babble.com, and on shows such as The Tonight Show and 20/20. She has been a correspondent for Extra and Good Morning America. Currently a work-at-home mom, she lives near Vail, Colorado with her family.